Background: The research of innovative nanostructured materials will be helpful in designing high performance supercapacitor devices in the near future. In this direction, graphenebased structures, such as Vertically Oriented Graphene Nanosheets (VOGNs), have emerged as promising architectures due to their interesting chemical, structural and electrochemical properties. One of the main strategies to enhance the performance of supercapacitive materials consists of the functionalization or modification of their surfaces by means of various approaches focused on doping or the deposition of electroactive material coatings/films among others. Particularly, in this study, the doping effect, by nitrogen plasma, on VOGNs was investigated as innovative electrodes for on-chip supercapacitors. Methods: Nitrogen-doped VOGNs (N-VOGNs) were characterised at morphological (SEM and TEM techniques), structural (XPS and Raman techniques) and electrochemical levels, respectively. Subsequently, the potential of such doped graphene nanostructure was evaluated in a symmetric supercapacitor device using a coin cell configuration. The properties of the supercapacitor were examined in terms of capacitance, energy and power density and lifetime. Results: A maximal N-content of 17% was achieved for VOGNs with a vertical length around 370 nm, through exposure to a N2 microwave-plasma in an electron cyclotron resonance (ECR)-CVD reactor. The deconvolution of N1s spectrum of N-VOGNs reflected the presence of three main peaks corresponding to pyrrolic (400.2 eV), pyridinic (399.0 eV) and graphitic (401.2 eV) nitrogen forms, demonstrating the incorporation of nitrogen into graphene structure. The doping effect reflected an important impact on the morphological (surface defects and reactions, porosity) and structural (conductivity) properties, which allowed to enhance greatly the capacitive properties compared to undoped VOGNs. Conclusion: N-VOGN based supercapacitors have demonstrated excellent capacitive properties such as high volumetric energy (28 mWh cm-3) and power (360 W cm-3) densities as well as an outstanding cycling stability (retention of 80% after 300 000 galvanostatic charge-discharge cycles). These results are very promising compared to the state-of-the art dealing with carbonaceous structurebased supercapacitors. 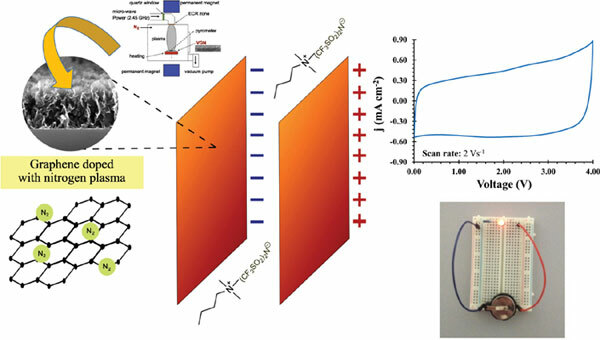 Consequently, this study paves the way to explore the in-depth potential of such nanostructure in the development of innovative high performance supercapacitors. Keywords: Doping, graphene nanosheets, ionic liquid, supercapacitors, vertically oriented graphene, VOGN. Keywords:Doping, graphene nanosheets, ionic liquid, supercapacitors, vertically oriented graphene, VOGN. Abstract:Background: The research of innovative nanostructured materials will be helpful in designing high performance supercapacitor devices in the near future. In this direction, graphenebased structures, such as Vertically Oriented Graphene Nanosheets (VOGNs), have emerged as promising architectures due to their interesting chemical, structural and electrochemical properties. One of the main strategies to enhance the performance of supercapacitive materials consists of the functionalization or modification of their surfaces by means of various approaches focused on doping or the deposition of electroactive material coatings/films among others. Particularly, in this study, the doping effect, by nitrogen plasma, on VOGNs was investigated as innovative electrodes for on-chip supercapacitors.